The International Chamber of Commerce’s (ICC) biggest educational event of the year, the ICC International Commercial Mediation Week, is currently underway at the world business organization’s Global Headquarters in Paris. The 4th ICC Mediation Roundtable launches the prestigious event and assembles leading professionals and academics in the field of alternative dispute resolution (ADR). Each participant will go on to take part in the 12th ICC International Commercial Mediation Competition, which is held from 3-8 February 2017. More than 130 professionals have committed to embarking on a week-long adventure to forge relationships; exchange best practices; and impart their wisdom, knowledge and passion to the 65 university teams competing for success at this year’s ICC Mediation Competition. 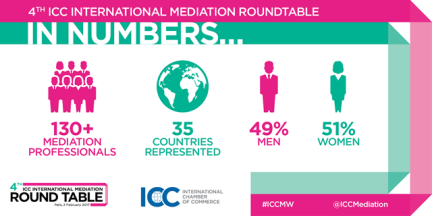 ICC Mediation Week has evolved into the most important forum for the global conversation between practising commercial mediators from all around the world. To ensure all topics are relevant, Roundtable discussions are carefully developed with the help of professional mediators and academics who have working-knowledge of what is current in the industry. This year’s invitation-only event included remarks from representatives of the ICC International Centre for ADR ; an exciting “speed dating” session that got professionals talking about their personal experiences; several interactive workshops on subjects from co-mediation in cross-border disputes to codes of conduct; a discussion led by mediator and co-founder of the Young Mediators Initiative (YMI), Angela Herberholz, which explored mediation trends throughout the world; and a plenary session moderated by commercial mediator, Geoff Sharp, that talked through the challenges mediators face. The conclusion of the Roundtable marks the beginning of the ICC International Commercial Mediation Competition. Professionals will then spend the remainder of the week volunteering their time and expertise to student teams who will compete in almost 150 mock mediation sessions. Some will act as mediators, making use of their own experience in resolving cross-border disputes; while others take on the role of judges, assessing each team’s negotiating and problem-solving skills, as well as their ability to make good use of the mediator. Though the event allows students the occasion to put theory into practice, the added bonus is their interaction with some of the world’s top mediators. This unique exchange is a valuable opportunity for professionals to enlighten and engage a new generation of mediators and mediation users through guidance, feedback and support. 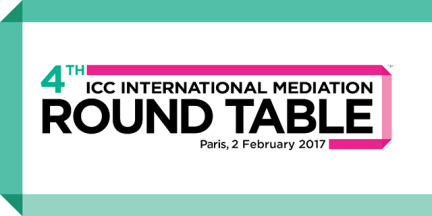 Keep up with all the latest ICC Mediation Week details and updates via@ICCMediation and be sure to use the event hashtag, #ICCMW .